Gearing up for some summer beach reading perhaps next to an ocean that is undergoing rapid acidification from an over intake of carbon dioxide, I take a detour to the library after an email notifies me that a book I have on reserve is ready for pickup. Suddenly my best laid plans for a little light reading are scrapped in favor of educating myself about subject matter that promises to be a tad bit heavier than I had intended for the break: mass extinction. If extinction is a morbid topic, mass extinction is, well, massively so. It’s also a fascinating one. 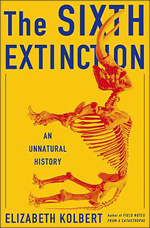 No, Elizabeth Kolbert’s The Sixth Extinction: An Unnatural History may not have been the beach book I had in mind, but as I turned the pages in equal parts awe and horror I could not have asked for a more worthwhile or captivating read. On an otherwise ordinary day sixty-five million years ago, an asteroid six miles wide collided with the earth. Exploding on contact, it released an energy on the order of a hundred million megatons of TNT, or more than a million of the most powerful H-bombs ever tested. Debris, including iridium from the pulverized asteroid, spread across the globe. Day turned to night, and temperatures plunged. Basically if you were a triceratops in Alberta, you had about two minutes before you got vaporized. With matter-of-fact prose, Kolbert lays out research that packs a punch and carries enough weight to make even the most hardened cynic or climate change denier take notice. Most of the world’s major rivers have been damned or diverted. Fertilizer plants produce more nitrogen than is fixed naturally by all terrestrial ecosystems. Fisheries remove more than a third of the primary production of the oceans’ coastal waters. Most significantly, Crutzen said, people have altered the composition of the atmosphere. Owing to a combination of fossil fuel combustion and deforestation, the concentration of carbon dioxide in the air has risen by forty percent over the last two centuries, while the concentration of methane, an even more potent greenhouse gas, has more than doubled. It is a safe assumption that there will always be differing opinions surrounding scientific theories. Kolbert’s research traces its roots all the way back to a time when even the idea of extinction (as well as mass extinction) were new and foreign concepts that, as such, generated varying hypotheses. Time not only lends itself to amazing discoveries but also the evolution of knowledge. But it is important to note that Kolbert’s study is not one in which the politics of debate take precedence. Its aim is far more grand, namely, an end result that holds the power to change your perception of what it means to inhabit a minuscule place within the biggest picture of all, existence itself. When the world changes faster than species can adapt, many fall out. This is the case whether the agent drops from the sky in a fiery streak or drives to work in a Honda. To argue that the current extinction event could be averted if people just cared more and were willing to make more sacrifices is not wrong, exactly; still, it misses the point. It doesn’t much matter whether people care or don’t care. What matters is that people change the world. In our search for answers, we will assuredly continue to do what we seem to do best—disagree—but we can certainly agree upon a baseline that this precious gift of a thing called life is anything but exclusive to humanity alone. Certainly humans can be destructive and shortsighted; they can also be forward-thinking and altruistic. Time and time again, people have demonstrated that they care about Rachel Carson called “the problem of sharing our earth with other creatures,” and that they’re willing to make sacrifices on those creatures’ behalf. One would be hard-pressed to read Kolbert’s opus about life and extinction and not come out thinking differently about what it means to be a member of the oft-inspiring, oft-destructive human race or feel the weight of responsibility we have protecting all living organisms whose fate mirrors our own, hanging so precariously in the balance.